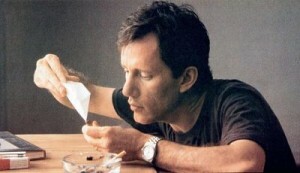 James Woods (Salvador) and Sean Young (Blade Runner) star in the 1988 cocaine-fueled cautionary drama The Boost. James Woods is introduced to cocaine in The Boost. Living the high life – figuratively and literally – married couple Lenny and Linda Brown (Woods and Young) will see their fast lane L.A. lifestyle come crashing down around them when the real estate market takes a sudden downturn. Unemployed and in debt, Lenny and Linda’s hedonistic lifestyle and casual drug use soon spiral out of control as they careen toward an abyss. Directed by Harold Becker (Taps) from a screenplay by Darryl Ponicsan (based on the Benjamin Stein book Ludes: A Ballad of the Drug and the Dream), The Boost is one of the more convincing portraits of drug addiction to hit the big screen in the Eighties. Much of that is due to Woods, who delivers one of his trademark manic performances.